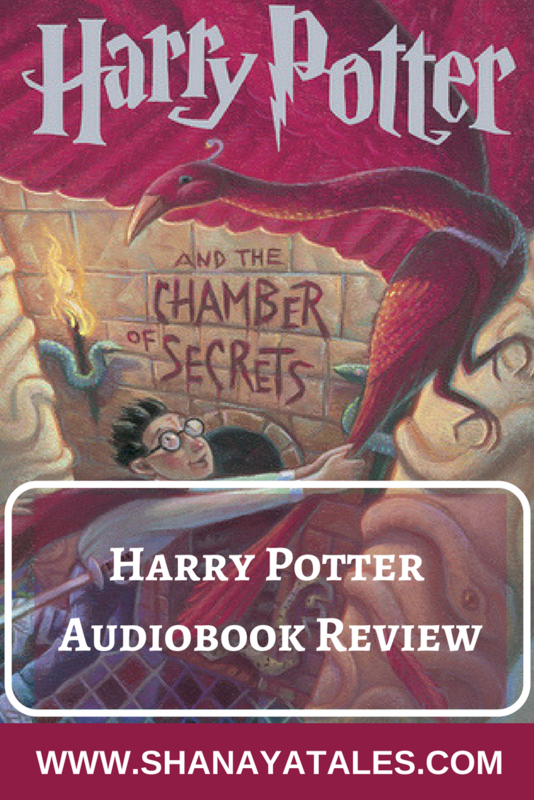 If you’ve been following this blog, you know that some time back I checked out and reviewed the Harry Potter and The Sorcerer’s Stone Audiobook. Back then I only meant to check out one Harry Potter book on audio, just to get an idea of how it feels to listen to this series, as opposed to read it. But after all these years I should have known better, I should have known that when it comes to Harry Potter I can never stop at one, and so here I am, binge-listening to this entire series on audio. Yes, I’m hopeless, more so when it comes to this book series. 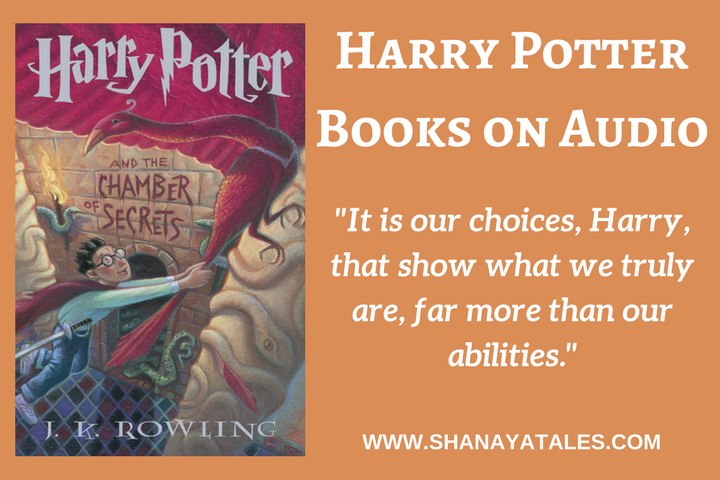 Anyway, today I’m here to talk about the latest book I have completed in the series (on audio)- Harry Potter and The Chamber of Secrets. Okay, so to keep first things first – a lot of what I said about Book 1 holds good for this book too (and I’m pretty sure that will be the case with the next books in the series as well) – it was wonderful to reconnect with some of my all time favorite characters, follow their journey all over again, and relive some of my favorite childhood literary moments. Having said that, as I am reading this book for what seems like the millionth time (which means some of my brain space is now free to dissect it) and also ’cause I’m reading this series after a break of some years, I couldn’t help viewing some of the things that happened in this book in a different light, and it’s made me question some things which I’d otherwise ignored/overlooked. So that’s essentially what this post is about, me sharing some of my thoughts about this book, and also a question that cropped up in my mind as I re-read this book. Which means that this is not a review post, it’s more of a discussion. So if you are looking for a review of this book – here are 3 words for you – read it now. I am serious, go get Book 1, and start reading now. Oh and stop reading this post, because the next section will contain spoilers. Anyway, those were my thoughts when I re-read/listened to this book this time, and now onto the question that I’d really like to hear your thoughts on as well. So as I was listening to this story, I was wondering if Lucius Malfoy knew about Voldemort’s horcruxes, and the fact that there was a teenage Voldemort alive in the pages of the book that he put with Ginny’s things, or was he just taking a wild chance sending something that the dark lord possessed back to Hogwarts. The latter scenario seems unlikely for someone like Malfoy, so I think he was either aware of what the book was capable of (if so – how?) or was ordered to send the book back to Hogwarts with Ginny (if yes, then – by whom? because it couldn’t have been Voldemort, as he was merely a shadow of himself at that time). What do you, fellow Potterheads, think? That’s all from my end, folks. I would love to hear from you. Have you listened to this series on audio? Or any of your old favorites on audio? How did you find the experience? Oh and for people who haven’t yet started with audiobooks, I feel like listening to your old favorites is a great place to start. You already have familiarity, so you don’t have to worry about not being able to understand or losing track, and it also gives you a chance to reconnect with your favorite books and characters while you do your household chores. Win-Win! Yeah starting with an old favorite always helps. Let me know how you find it? I was so in the Harry-Hermione camp until book 5, when it just seemed natural for the shift towards Ron-Hermione angle. I think that’s the mark of a very good writer. She knows well in advance who has to pair off with whom and keeps the readers guessing even though she knows all along. Not really caught on to the Horcrux thing that early, to be honest. Plus, I kind of read book 7 at one sitting, so I need to slow down and read it again some day. Gy is ALL HP this and HP that and my memory is so foggy. Maybe this will be on my re-read list in March. Never tried audio books although I love podcasts, so maybe I should give this a go. I never thought about audio books… Now that you have mentioned it, one more thing to be added. I know Shilpa also likes audio books. As for Harry and Hermione, I too was disappointed. I mean they could be such power couple. But not anymore. It all makes sense in the end. Ron and Hermione totally balance each other out. The kind of relationship one would like to be in. Audio books are not for me. I can barely concentrate on music too. I read the books very late, sometime last year to be honest. By then thanks to the movies and people talking I knew that it was Ron and Hermione. Honestly, I was never a fan of Harry so I was happy that she ended up with anyone other than him. Hahaha..okay that is a first. What bothers you about Harry? And I’m not asking because I adore him or anything. Mostly I love the books and the story as a whole. But still, I am curious. Why did he annoy you? ok I am the only one here who was rooting for Ron and Hemroine; I loved how she bossed Ron on the train in the first book itself – for me it was a natural progression! Coming to Malfoy, he only wanted to induce terror through that diary by making known that there are still things of Lord Voldemort that are floating around, he was boosting his legend. He had no idea that it was a horcrux or he wouldnt have taken it so lightly – Albus Dumbledor says so in reply to Harry when he asked him this question. I agree with that logic – had he known it contained a piece of his master’s soul, he would have been a little more careful with it and not wasted it so. He had no idea that the chamber could be opened with it; though once it was open – he was thrilled as he ofcourse knew its existence from being part of Voldemort’s crew since ages. I havent explored audio books yet; I dont know if I could! Lets see!! Yes, yes, now in the re-read, of-course I see it. Ron & Hermoine were always meant to be together. And I agree about Malfoy too. He was an arrogant, know it all prick, but had he known the truth of the diary, he might not have treated it as casually. Also, try audio-books, they might not be for you, but if they are, they are total game-changers! So glad you are enjoying the audio series! It’s always fascinating to me how you can pick up new things with a re-read, especially a book like this, with an entire series that follows. My son got a really bad concussion a few years ago, playing soccer in high school, and he was put on a strict regimen: no screens at all, no reading, etc. So, his solution – even though he claims to hate reading! – was to ask me to get the Harry Potter audio books out of the library – he listened to them one after another with his eyes and closed & lying on the couch. he loved them (he had only read book 1 before & seen all the movies) – they pretty much saved him for those months! Hope you enjoy the rest, too. Oh sorry to hear about his injury. But I am glad he found a way to connect with books in-spite of the restrictions. I hope he is doing better now. Love audiobooks! Thanks for this review– can’t access many audiobooks where I live, and this looks tempting. Yeah I have heard that they aren’t easily available everywhere, but if you ever get a chance, do check them out. They are total game changers! I need to get to audio books. I did try one but I found my attention wandering. It’s a good idea to listen to a book I’ve read already. Since N is floundering with Chamber of Secrets maybe we’ll listen to it together. Now onto Malfot – I don’t think he knew that the diary was a horcrux or perhaps he’d have been more careful with it. But I’ll have to re-read the book to get a clearer picture. Yes, I would definitely recommend that you start with an old favorite, it might make it easier for you to get on board. Also (and this is just a suggestion), see if you can not introduce the audio-books to N yet (unless of-course she is really struggling with reading it), because these audio versions can get really addictive, and at their age it’s better for them to explore books the old fashioned way, lest they choose to never read and only listen instead. I am only mentioning this because I have seen this happen here over and over again.